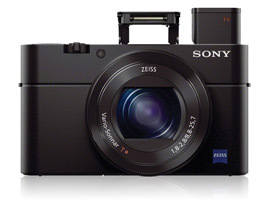 Sony’s original Cyber-shot DSC RX100 model was notable for combining a physically large 1-inch type CMOS sensor and relatively high-speed stabilized 28-100mm f1.8-4.9 Zeiss zoom in a small and compact body not much different from rivals using the much smaller 1/1.7-inch type sensors. The result was a highly desirable and capable camera that could be taken just about anywhere. A year later Sony announced a revised model with adopting a rear illuminated (BSI) type CMOS sensor, albeit with the same pixel count. That model, the RX100 II also incorporated several compelling new features including a multi-function hotshoe (and compatibility with an optional EVF), tiltable rear LCD and WiFi. This year’s update includes a built-in 1.44M-dot EVF with a novel pop-up operation, built-in flash, 180-degree flip-up LCD and full-sensor read out during video capture – a first for the RX 100 series thanks to the Bionz X level processor. It also has support for the XAVC S HD video recording format, adding 100 fps slow-motion (albeit at 720p) and high bit rate (50 Mbps) options, plus ‘clean’ output via HDMI using an optional recorder – features more usually associated with high-end models. However, perhaps the most significant revision is the adoption of a new lens design. It’s still a Zeiss optic but with a narrower range equivalent to 24-70mm but with a faster variable maximum aperture of f1.8-2.8. The RX100 III is available now at $798. 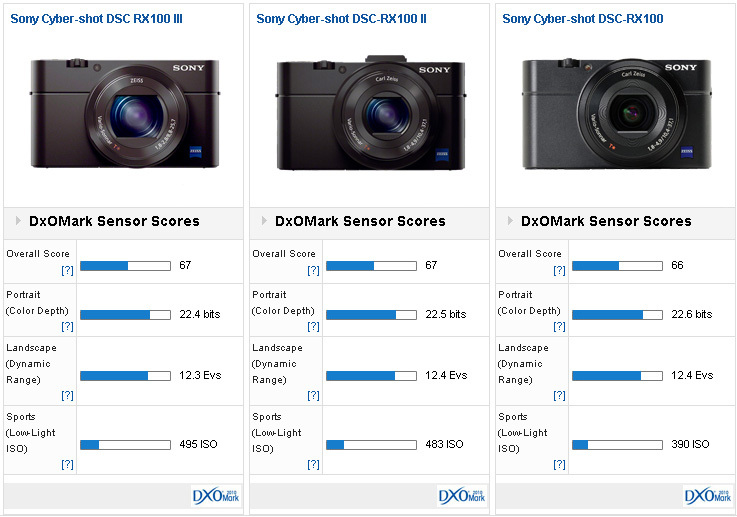 The 20.1Mpix sensor in the new Sony Cyber-shot DSC RX100 III achieved a DxOMark sensor score of 67 points, a good score overall, and placing it ahead of rival Nikon 1 models using the same size sensor, and some larger micro Four Thirds format rivals. For camera classed as ‘compact’ it has one of the highest scores for color depth (at 22.4 bits) and dynamic range (12.3 Evs). 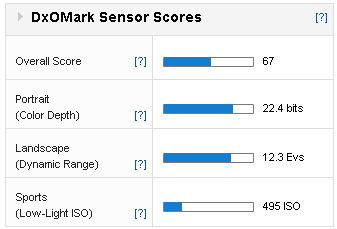 Low-light capabilities remain good for this sensor format currently, but sensors with larger surface area (such as the best micro four thirds types, and the APS-C sensor used by the Ricoh GR and Nikon Coolpix A) continue to outperform this Sony made imager. Although small compared to the Micro four Thirds and APS-C size sensor, the 1-inch type chip in the RX100 III has very good color depth, which is far superior to other compacts (albeit using smaller sensors). Although the Nikon 1 V3 1-inch sensor performs similarly to the firm’s Coolpix P7800 and the Canon PowerShot G16 with their smaller (1/1.7-inch type sensors), the RX100 III sensor maintains the lead for this particular format. 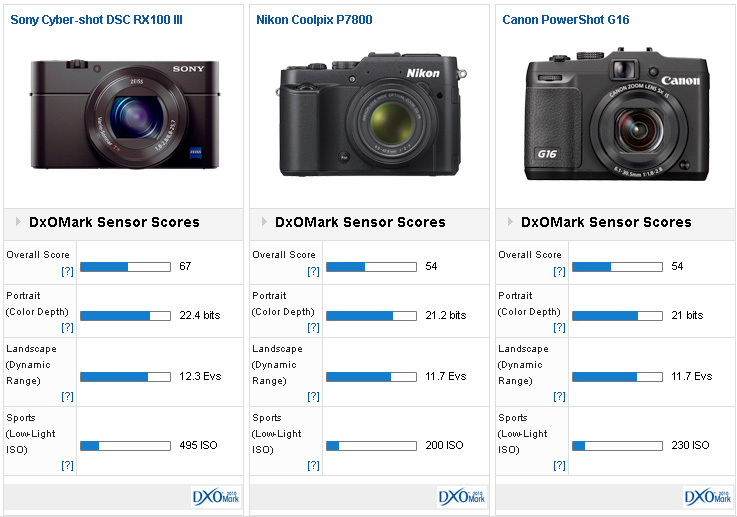 With a DxOMark score of 67-points – 13 points ahead – the RX100 III performs exceptionally well. 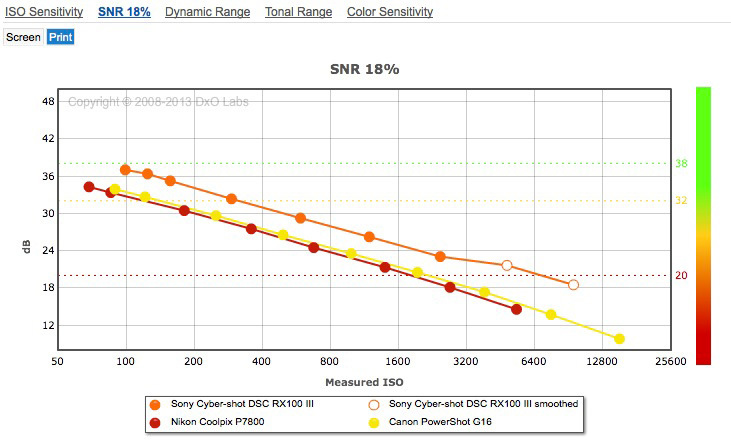 It has +2/3 stop better color than both models and +2/3 stop wider dynamic range at base. However it’s the low light capabilities that particularly stand-out in this company, with the Sony having a around +1.3 stop improvement over the two rival compacts. Noise levels may not yet challenge the best micro Four Thirds or APS-C models, but in the compact camera category it’s the top of the class. 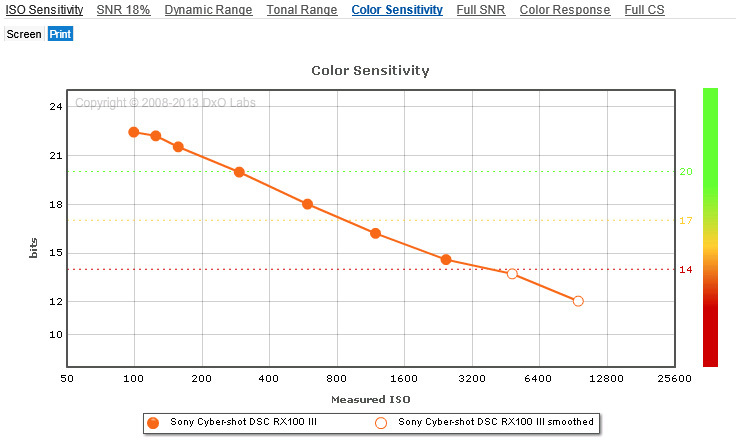 Dynamic range is not just wider at base, the RX100 III can also boast a wider DR at all ISO settings. 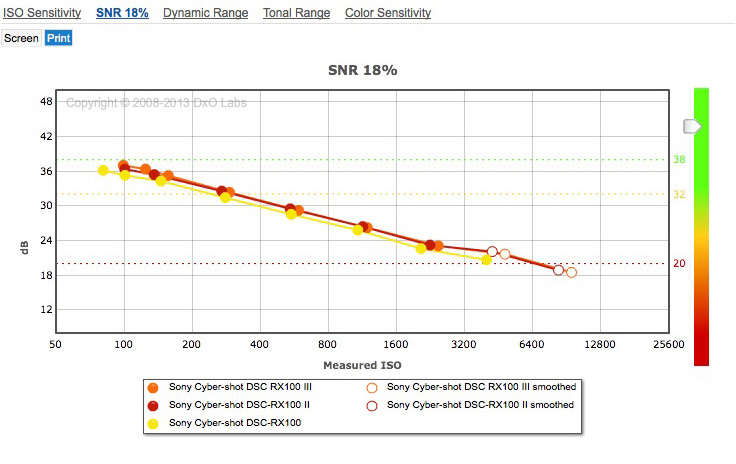 Although the RX100 II adopted a BSI type sensor over the original model, the increase in low-light performance resulted in a +1/3 stop improvement (albeit with the expected improvement in SNR across the ISO range) but which in turn equated to a mere 1-point lead overall. With the announcement of the new RX100 III there was no mention of any revision to the sensor, and so it looks in our testing – the two appear to share the same unit. 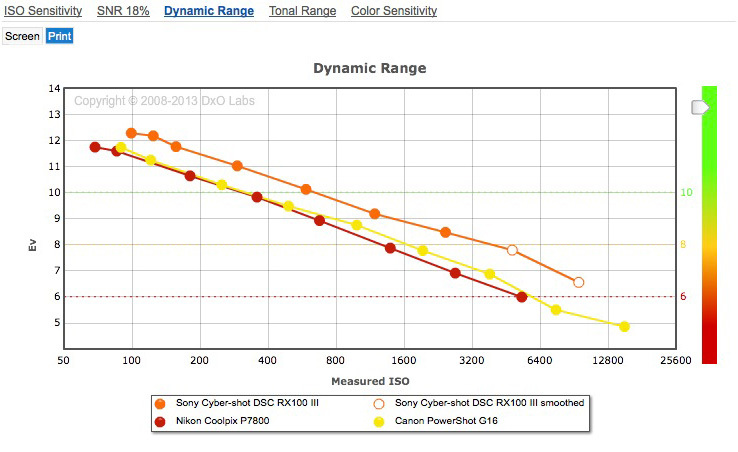 Color discrimination, dynamic range and low-light capabilities of the sensor remain essentially unchanged from the RX100 II across the whole ISO range. Although sensor performance of the RX100 III remains largely unchanged from the RX100 II both models reveal slight improvement on the original model. As the naming suggests, the new Sony RX100 III may not be the groundbreaking model that the original was, but it’s still at the top of the class and remains untouched for both the sensor performance and the high-end features. Some might criticize the shorter zoom range but the new high-speed maximum aperture combined with the wider 24mm field of view and advanced video capabilities makes the RX100 III, arguably, the most compelling of its type available today.